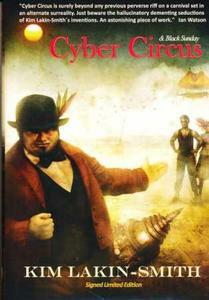 After writing several short stories that I enjoyed, Kim Lakin-Smith's novel Cyber Circus was recently published by NewCon Press. Q. If you ran away to the circus, what act would you join? A. If I could be any act in the circus, I would be an animal tamer. Wielding everyday household objects like a wooden chair or a bullwhip, I would commune with Vermicious Knids, take my vorpal sword in hand against the Jabberwocky, and set monsters off on a wild rumpus. The top hat is rather dapper too.